William of Mass Destruction: It's Our Fourth Gotcha Day. It's Our Fourth Gotcha Day. Yep, it's been four years since Mom went to the shelter for a little girl and wound up taking us home. How lucky was that? And look what she got us! A new hummingbird! Well, she didn't really. But she got very excited to see this Rufous hummingbird yesterday evening. He was back today, too, so she was able to take these pictures. Since they don't nest here and all we ever see are black-chinned hummers, we got kinda excited too. He's been a lot of fun to watch--he chases everybody, like Ivan, and he's copper-colored, like me. So we do think he came to celebrate with us. We left the photos extra large so you can biggify them. And look! She didn't even cut off his tail or his beak! Happy Gotcha Day cuties! Great hummingbird photos. Happy 4th Gotcha day Izzy and Ivan !!! We are super happy you two got chosen! Happy happy Gotcha Day kitties! Double the fun~! Happy Gotcha Day to you both, lots to cellybrate. Me and mum think the hummer pics are cool. 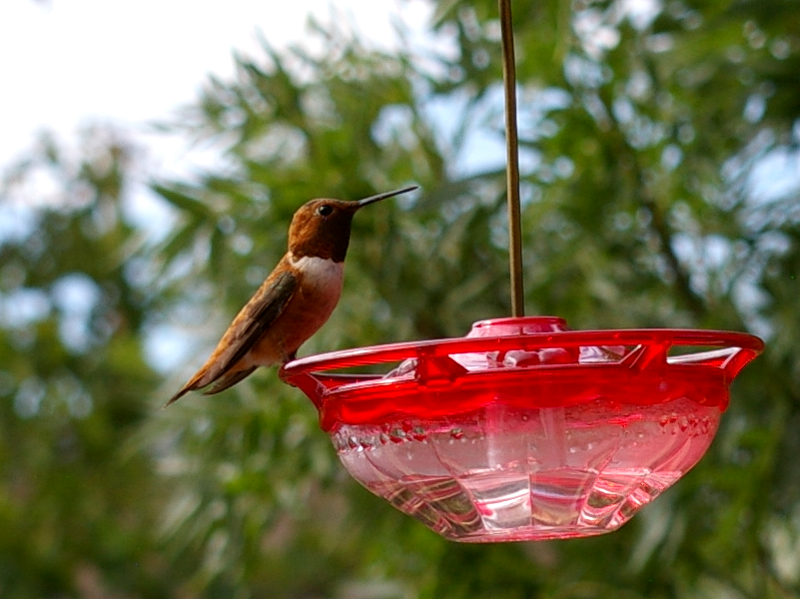 We only get the ruby throat hummers here. Mostly green on their backs, white fronts. You got a really good pic! 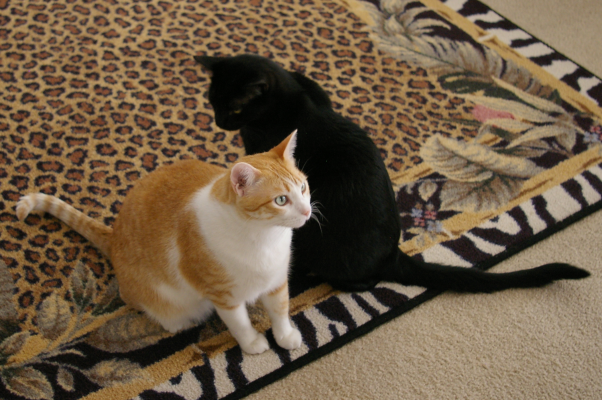 Happy Gotcha Day, Ivan and Izzy! That was nice of the humming bird to come and bring you good wishes. Your mom got great photos of him too. Yaaaayy!! Happy fourth Gotcha Day, guys. 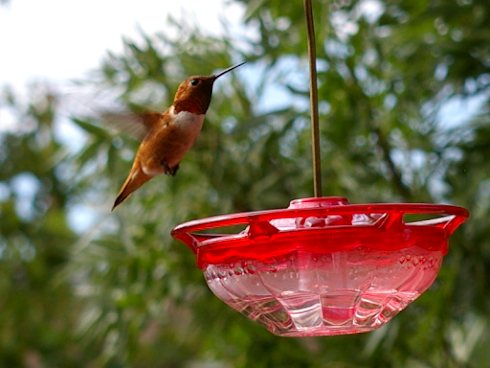 Aren't those hummingbirds just the most amazing things? The pictures are indeed beautiful. Happy weekend, y'all. Happy Gotcha Day sweet friends! I hope you both have a very special day! 4th Gotcha Day, Izzy and Ivan?!? How is that possible...that much time has NOT gone by...WOW! Love this photo of you two; kind of yin/yang. Cool hummer; we don't get many, but I am planting more hummer-friendly plants, so maybe next year! How special that you got a visit from this little guy! I do think it was a birthday present of sorts. Happy Gotcha Day, you two ! WHAT a TREAT! My hummingbirds are Ruby Throated ones. Happy Gotcha Day for both of you. We really love the picture of you two. The hummingbird looks like he came to celebrate with you too. Really amazing photos of the hummingbird. The coloring is really beautiful. Thanks for the share. Have a great day and keep on celebrating. Beautiful--you are very lucky--I have never seen one of those hummingbirds-though I do get the ruby throat but never a rufus!